This recipe for Instant Pot Vegan Pumpkin Coffeecake Steel-cut Oatmeal makes a ton. It’s a departure from my usual recipes for two servings. You actually get 6 to 8 servings – enough to make once and grab breakfast from the fridge or freezer all week long. Looking for my older recipe for Pumpkin Coffeecake Oats that uses a small slow cooker? Don’t panic, it’s not gone and you can find it right here. One of the things I love about my Instant Pot is that I can make large or small amounts in it. You can go to my recipe for Earl Grey Oatmeal for 2 made in the Instant Pot if you don’t want to make a large batch. This oatmeal is actually not cooked with any sweetener. If you know that you’d like to sweeten the whole batch at one time stir in the cinnamon and sweetener before you divide out the oats into servings sizes. Then just top with some chopped nuts before you freeze them. Let me know in the comments if you prefer to make a week’s worth of oats ahead of time or if you’d rather make them every day. This makes a large pot of pumpkin oats that you can keep in your fridge for the week, or freeze in individual servings for months. Either way, you do it you'll be glad you don't have to make breakfast when you wake up! Add all the instant pot ingredients to your stainless steel insert and put it into the base. Secure the lid and make sure the valve is closed. Set on manual and cook for 3 minutes. While the oats are cooking, mix all the topping ingredients together and store in an airtight container. Once the oats are cooked, allow the pressure to come down naturally. Once the silver pressure indicator goes down you can open the lid. Serve sprinkled with topping and/or your favorite nondairy milk! Sometimes I use whole milk’ raisins, brown sugar and nuts to make it lower in fat, it’s good with almond or coconut milk, dried cranberries or raisins, unsalted nuts, I like sliced almonds. With coconut milk, shredded coconut is tasty. I use a crockpot liner in the pot and the brown rice setting. It’s ok if you have too much for one breakfast. Just seal up the bag, add a little more milk and microwave the next morning. It’s the best! I like instant oats, then grind up another cup ful into powder in my blender. If it’s too wet, stirring in some instant oats flour thickens it right up. Steel-cut oats take much longer to cook. I think quick oats cook too fast to make in the pressure cooker and I haven’t done rolled oats yet. For rolled maybe try cooking for 1 minute and see how that does. I’ll try to make some and come back with more info later this week! Thanks Kathy. If i get to it before you do, I’ll let you know how it turns out. 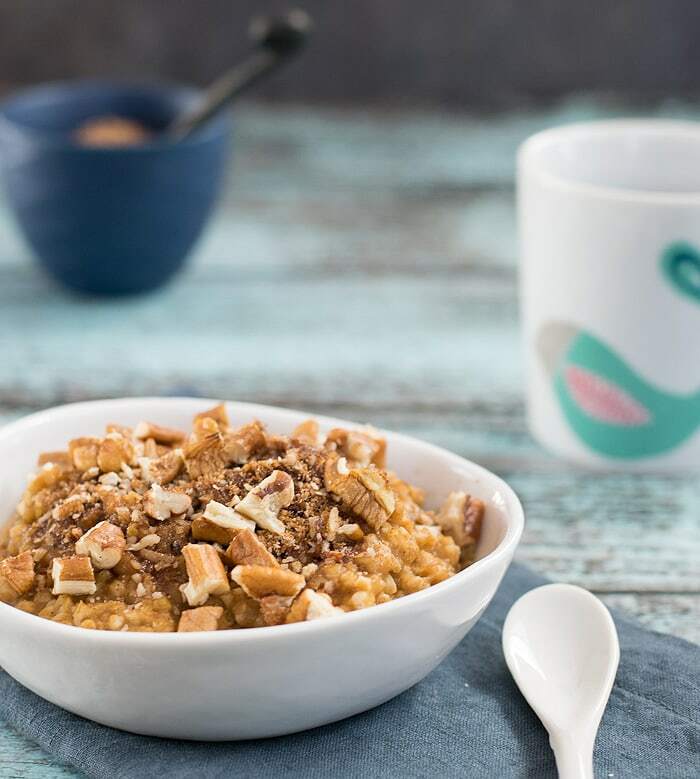 This Coffeecake Oatmeal looks absolutely incredible! Now, I cannot wait to have my breakfast! Thanks for sharing! 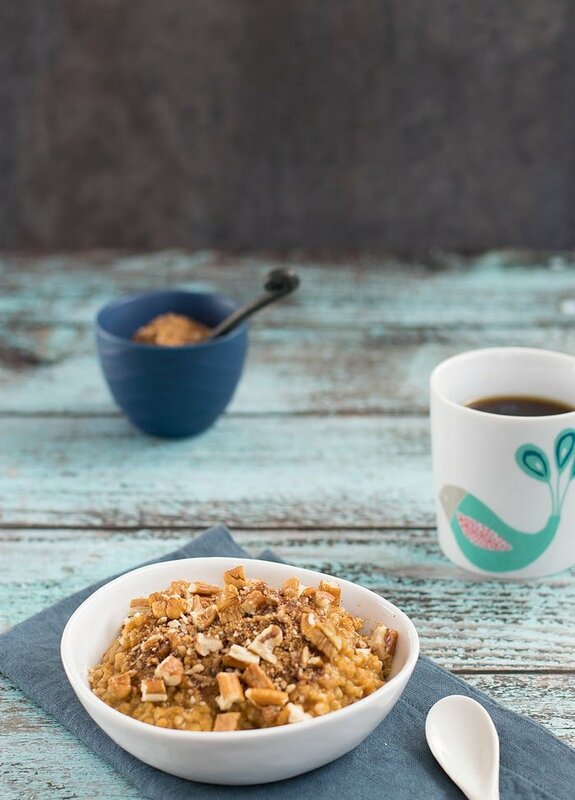 This Coffeecake Oatmeal looks absolutely irresistible! Now, I cannot wait to have my breakfast! Thanks for sharing! What a hearty and healthy breakfast. This would give me something to look forward to in the morning! I am always looking for instant oatmeal recipes. They are so delicious and keep me full until dinner. LOVE your recipe and I am going to try it next week. Just got a bag of steal oats at Costco, this would be a great recipe to make.. .Been trying to incorporate it into my diet. Thanks for sharing!!! Looks so delicious and I’ll bet it tastes that way! thanks! Perhaps this was a typo in the original recipes, but it took 14 minutes for the recipe to be cooked, NOT 4. I subbed one can of coconut milk for the equal amount of water, added two tablespoons of blackstrap molasses and used Penzey’s Pie Spice in place of the spices you had listed. Delicious! Meant to say 13, not 3. After three minutes, there was way to much liquid for this to be anywhere close to done. Did you do a natural pressure release? This is how long I always cook my steel-cut oats in the Instant Pot. When I open it, it does need to be stirred and then it’s the right consistency for me. With that said your oats could have been older and take longer to cook or some other reason. Since that’s unpredictable, you can always cook it more like you did. It’s been 25 minutes now and it’s still soup. I don’t see how 3 minutes could possibly work. Agreed! I came back to recheck the recipe. The amount of water had me scratching my head to begin with. Now, I’m thinking I should’ve halved it. Frustrating as I was trying to make a quick breakfast before school. Fail. All the comments I saw before making it were from people who had not made it yet but I decided to try it out anyway.. This has no taste. The toppings help a little but not much. It took the same time as making it myself because it took awhile for the pressure to build up and when I do it myself I am able to control the creaminess better. It was too watery. Not a recipe I’ll try again. Sorry, it’s not to your taste, but it is a recipe I’ve made dozens of times. In any of the recipes on my site you should feel free to embellish them to suit your tastes. I made this today for our family of ten. I made it exactly to recipe. We usually eat rolled oats fairly thick, with maple and brown sugar milk and butter. This was a bit soupy, but 9 out of ten loved it! I have a child with an eating problem, and she ate two bowls- the largest quantity she has ever consumed!!! Thank you so much???? Made this today for breakfast. I would be curious to know that those who are having issues with it being too “soupy” are you using the measuring lines on the inner pot or a liquid measuring cup. I used a liquid measuring cup and 4.5 cups of water in a liquid cup only comes to line 3 of the inner pot. That would lead me to believe that you would have an excessive amount of water after the fact. By the time we sat to eat it was cooked, thick and had an earthy pumpkin flavor. I used pumpkin pie spice in place of allspice. That was the only thing I changed. Oh I have the IP Lux60 6 in 1. For what it’s worth. I re-cooked this again today since there’s been so much talk. Mine did fine at 3 minutes, but I like my steel-cut oats to come out chewy when I cook them in the Instant Pot. I am using regular steel-cut oats and not quick cooking (sometimes known as Scottish oats). There are many conversations in the Facebook Instant Pot groups about timing on steel-cut oats. If you like them very chewy cook 3 minutes, NPR – if you like them softer or even mushy you can cook 7 to 10 minutes. It’s really a personal preference. If I’m in the mood for softer oats, I cook them in the slow cooker overnight. I think the “Coffeecake” in the title is leading others to believe that this should have more of a cake texture, rather than oatmeal. (that was my first thought anyway) Still looking forward to trying it though! Maybe your right. But it’s oats with a coffeecake topping. I hope you like it! Yes! That’s a great point. I expected a cake-like texture from the title. I cooked this as instructed, sat 30 minutes and the oats were barely cooked. Added another 3 minutes with NPR and more musher, but still a a grainy crunch to it. Maybe this is how steel oats are? But, definitely needed more than 3 minutes to bother feel like I had a mouth full of pebbles. Topping added some sweetness, but I added some Nutella for additional sweetness. I also used a liquid measuring cup for the liquid and a dry measuring cup for the oats. Mine was not soupy. I added sweetener (Stevia) to the oats along with the vanilla. I also used pumpkin pie spice (3 tsp) instead of the other spices. I made my topping with pecans, erythritol, and cinnamon and it was tasty. A teaspoon of vanilla yogurt on top is delicious too. Is this recipe in your new cookbook? Actually, it’s not. But I have one in the book for rolled oats cooked in individual ramekins. I know it seems very long, but I like cooking steel cut oats for 20 minutes NPR. To me, they are just right. I also use a 1 cup oats to 3 or 4 cups of water. I’m going to try these. To add to the comments, I did 3 minutes and let the pressure come down naturally. When I opened the pot, it did look soupy, but I thoroughly stirred it, then put the lid back on. 10 more minutes of just letting it sit, and it’s perfect!! Nothing soupy about it. Filled a bowl, added the topping and it’s delicious! Unlike other comments, I didn’t find it bland at all. In fact, this is now my very favorite steel cut oatmeal recipe!! Many thanks Kathy!! Hi, Kathy! Thank you for this recipe! I left out all the sugar, put the pecans in the IP, and used 1 Tbsp Pumpkin Pie Spice. My boyfriend LOVED, and it was a big hit! I just made this recipe today. I decided at the last minute to use the Porridge setting on our Instant Pot Duo 7-1. I think I should have stirred it a few times because there was a lot stuck to the bottom when it finally finished. After the Porridge setting was done I let it sit with the lid on for 20 minutes. The longer it sat, the thicker it became. The only drawback for me was the flavor. Adding some brown sugar definitely brought out some flavor but I have to wonder if my spices are old. It really didn’t taste that great. However, I’ve been looking for ways to get more fruits and vegetables into my diet and I’m willing to tinker a bit to make this recipe work for my husband & I. Made this today and just mixed the topping in with the oatmeal. I’m going to try adding a banana to it next breakfast. Just sounds good to me but it’s amazing just the way it is. Wanted to thank you, Kathy, for all the detective work you do on our behalf. Just ordered your oatmeal book from Amazon. Hi. This looks delicious. My oatmeal lists the ratio of oats to water as 1cup oatmeal to 4 cups water. Half a cup oatmeal to four and a half cups water seems really off. Is this because it is cooked in the instant pot? I love this recipe! I cook on manual high pressure for 4 minutes and do a NPR. I stir it and then let it sit for about 10 minutes to get it to the consistency I like. Sometimes I add mini chocolate chips with my toppings, tastes just like a pumpkin chocolate chip cookie! I generally make my oatmeal with a mixture of soy and almond milks. Would the cooking time be the same if I made that modification to this recipe? I don’t like oatmeal cooked with water. The cooking time would be the same. This was great. I think I’ll add another half cup of water and cook for 7-8 minutes for a creamier texture. But the flavors were great. I like my oatmeal on the sweet side with lots of nuts so I added all the toppings separately to taste. I can report that a little squirt of canned whipped cream takes this over the top! Wondering how to convert this to overnight oats since i don’t have an instant pot. Does the canned pumpkin need to be cooked? or could i do rolled oats, pumpkin, etc in mason jars and sit in the fridge? Add the topping in the morning right before eating… ideas? I followed this recipe exactly. (I don’t do that very often.) I found the oats to be a bit too underdone for me so I put our servings back in the IP (after we had put the topping on them, oops) and gave it 7 more mins & NPR. 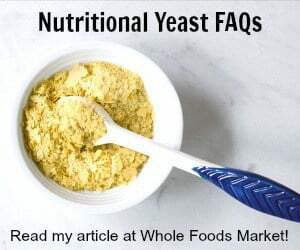 I tried it & it was much better – still with some “bite” to it but with a lot more oat flavor. So I let it sit for 10 more mins. It was pretty good. I can’t taste the pumpkin. I then added some chopped dates & dried cranberries & a spot of milk. Kathy asked us to comment whether we like to make a week’s worth of oats, or every day. I prefer to make a big batch (at least a week’s worth) and then simple re-heat the leftovers. I reheat on the stove, just add a little Almond or Soy milk to the bottom of the pot, then put the oatmeal in and heat on low. This is such an easy way to make a week’s worth of healthy breakfast! I wasn’t expecting it to taste as good as it does w/o the milk or sugar but it really does! I add brown sugar to mine after heating it up. Bravo! I’m wondering if the reason this recipe turns out somewhat soupy is because the liquid from the pumpkin is not taken into account? I usually make instant pot steel cut oats with 3 cups water and 1 cup oats, cooking for 4 minutes (sometimes a couple more, but 4 works). That ratio should work with 4.5 c water/1.5 c oats, but the pumpkin adds a good bit of volume to the liquid (obviously not exactly 1.5 c since pumpkin is thicker). After 4 minutes and natural release, mine was VERY liquid-y…seemed like more than half liquid to cooked oats – not ready to eat. I threw in a bunch of chia seeds to try to absorb some of the liquid and cooked for 4 more minutes. It ended up not coming all the way to pressure (I think the chia seeds reduce the water too much for the pressure build-up), so I didn’t have to wait for the release (good thing because my people were getting restless!). It was still thin, but it worked okay. I did really like the flavor idea – I added maple syrup and ginger instead of allspice. I would make again with maybe 1/2 to 3/4 c less water to account for the pumpkin. I’ve tried this recipe twice, with a number of variations (extra water, longer cooking time, ,etc.) and it never comes to pressure! I love the idea and the taste, but I usually end up cooking it through 3 cycles of IP attempts before it seems sort of done, and it has boiled, but never come to pressure any of those times. Any ideas?!! What quart size do you have? It works in my 6 quart and 3 quart. I’m wondering if you are using an 8 quart or maybe there’s something wrong with your IP. Does it work on other recipes? Hello, can’t seem to find steel oats here in the UK. Would I need to adjust the cooking time for using rolled oats or quick oats? Rolled or quick oats will not work in this recipe even with a reduced time. However steel-cut are called pinhead oats in the UK. That might be it. I developed this recipe with a 6-quqrt before the 8-quart existed. You may try doubling the recipe. I wonder if your pumpkin was thicker? Anyhow, when you get the burn notice you can add another 1/2 cup liquid and try again. My instapot beeped and said BURN on front panel – I stopped and stirred – tried again. However, it stopped again and said BURN. It was very thick. Any suggestions? What size IP did you use? It could be that you used an 8 quart or you could add more liquid. I, too, have tried making this recipe, twice, and both times I got the burn warning and had to transfer to the stovetop to finish. What pressure setting should we set the Instant Pot to? Low, Regular, or High? I am using the 6-qt IP-Duo. The pressure setting is high. I have never gotten the burn message cooking this, but if you are getting it consistently I would add more liquid. When I made this, it scorched and would not come up to pressure. I have a 6 qt IP. I followed the recipe as precisely as I could. This is the only recipe that I have made in the IP that has done this. Very frustrating. Did you use homemade pumpkin puree? I like the taste–I like to control the sweetness by the amount of topping added–and found 14 minutes at pressure to be just fine. Still a little chewy. I only used 1/2 t. allspice, because I was afraid it would be too much, but will try with the full 1 t. next time. I followed the Instant Pot recipe exactly and it came out perfect. You can adjust the sweetness, amount of cinnamon, etc. to your taste. Awesome recipe and definitely a keeper. I followed the recipe exactly and it kept giving me the “burn” error and wouldn’t finish cooking. I think this could be an amazing oatmeal if I could figure out the slight nuances. I used steel oats, canned pumpkin puree, water measured from a liquid measuring cup. What size IP are you using? I made this recipe in a 6 quart, so you made need to add a little more liquid. I’m a newbie (its not out of the box yet haha) and am pretty confused reading the comments. Following the recipe as is, some people are getting perfect results, some say too soupy, and some getting burn notices. I guess my question is how/why are people getting such different results using same recipe and same size IP? Does altitude or climate effect results at all? I wish I had an answer for you. I’ve made it in 4 different IPs myself in 6 and 3 quarts with no issues. Altitude does change things and if you are up high you will need to change all cooking times in your IP. Love this recipe. I’ve made it several times and it always turns out great. I make it with my own whole grain mix of steel cut oats, bulghur, quinoa, black lentils, or whatever I have on hand. Have you ever thought of doing dehydrator recipes? You have such an easy-going style and can explain things so well. I bought a dehydrator and none of the recipes come out. Thank you so much Lori! I do have the Breville and a super cheap dehydrator that I use. I will add that to my recipe list! Even when it is past pumpkin season, I love these flavors. Oats are the perfect way to get them in a delicious breakfast. I loved the flavors of this dish! What a treat for breakfast! 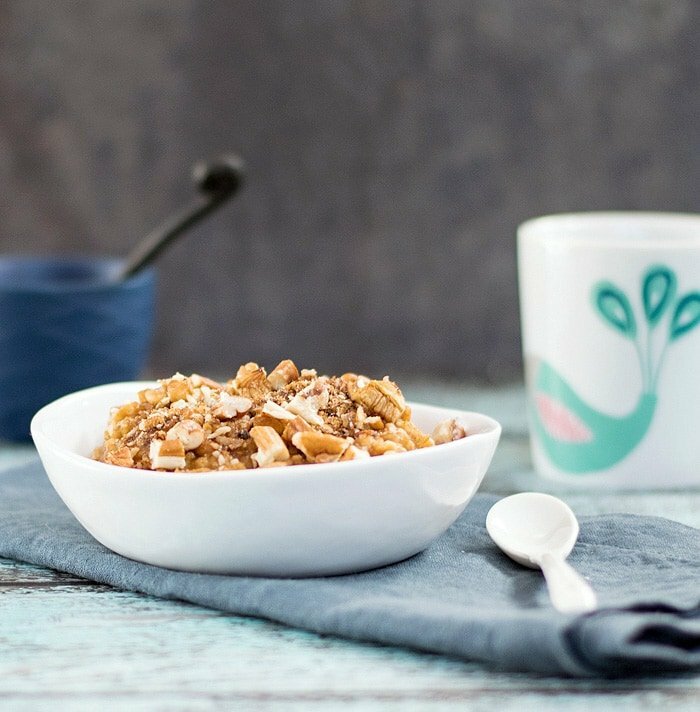 We find it easiest to prepare our oats for the week and warm up a portion each morning. Thanks for the yummy recipe!